"Thank you. I got your email and your phone message, and the package arrived today. 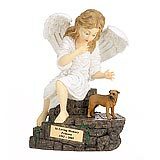 The urn is very handsome, befitting our beloved Miniature Schnauzer, Divot. While I wish we never had to do business, your service has been admirable and I very much appreciate that." 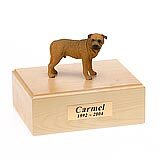 All available Bullmastiff dog urns and memorials will be displayed with the figurine on the Bullmastiff urn you select and in the appropriate size.